Transformers Dark of the Moon Review. More than meets the eye? Not quite. But what’s on offer is pretty impressive regardless. I could only nod my head in mute assent. Megan Fox will have that affect on a fellow. Sadly she’s nowhere to be seen in this, the third outing for the wildly lucrative franchise, having reportedly been fired by producer Steven Spielberg for daring to liken being in the employ of director Michael Bay to working for Adolf Hitler. Evidently Spielberg isn’t a big fan of similes invoking the name of the Fuhrer... can’t imagine why. Be that as it may, the team at Transformers HQ wasted no time in sourcing an appropriately leggy replacement stunner in the form of British model Rosie Huntington-Whitely, who puts in a convincing performance as Shia LaBeouf’s new squeeze. The action opens with Sam Witwicky (LaBeouf) doing a spot of job hunting. Despite being shacked up with a rich hottie, having recently graduated from an Ivy League college, only slightly less recently saved the world on two separate occasions before being invited to the White House and awarded a ‘Hero Medal’ by the President, Witwicky is still inexplicably considered a loser by his tracksuit-clad parents and is having even more inexplicable difficulty obtaining gainful employment. That is until he interviews with Bruce Brazos (played by a characteristically brilliant John Malkovich) and gains a job in the mail room of Accureta Systems, thus setting off a chain of events that, this being a Michael Bay film, will have suitably cataclysmic, not to say visually striking repercussions. For make no mistake, this is one damn fine looking movie. The extensively-utilised computer generated imagery is impeccable, and the Transformers interact with both their environment and their human counterparts with equal measures of realism. Our unlikely protagonist is once again played with admirable dexterity by the ever-likable LaBeouf, and tawny-haired temptress Huntington-Whitely proves an admirable and adroit replacement fox/Fox. Cameos from the likes of Malkovich and The Hangover’s Ken Jeong keep things fresh, and the central plot feature of the ageless Autobots/Decepticons struggle is also handled for the most part in an intelligent and compelling fashion. There are various deficiencies, most notably in dialogue and pacing (the film runs over two and a half hours) that have been commented on at some length by critics. But it is certainly an entertaining outing from Bay, and one on which no expense has been spared. Some enjoyable performances and an abundance of eminently impressive CGI keep things flowing nicely, and for fans of the franchise this third instalment will far from disappoint. More than meets the eye? Not quite. But what’s on offer is pretty impressive regardless. 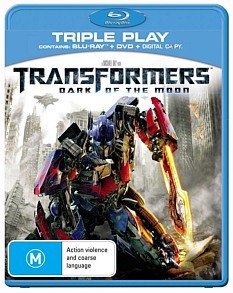 The Triple Play edition contains Blu-ray, DVD and Digital Copy versions of the film, with the BD edition running 154 mins and the DVD 148 minutes. Audio options are 7.1 Dolby TrueHD and DD 5.1 surround respectively, and both feature an impeccable 2.40 widescreen transfer that really pops on Blu. Sadly however there are no Bonus Features, which somewhat mars the experience; presumably however a features-laden Special Edition can’t be too far off.